Salyersville, the seat of Magoffin county, is located on the Licking River. A settlement was established in 1794, but the settlers were subsequently driven off by natives and didn't return until 1800. The original settlement was known as Prather's Fort, for one of the settlers, and Licking Station. It was later renamed Adamsville for William Adams, a prominent local citizen, and renamed again as Salyersville, for Samuel Salyer, after the formation of Magoffin county. The post office opened as Burning Spring in 1829, was moved and renamed Licking Station in 1839, moved and renamed Adamsville in 1849, and was finally renamed Salyersville in 1861. 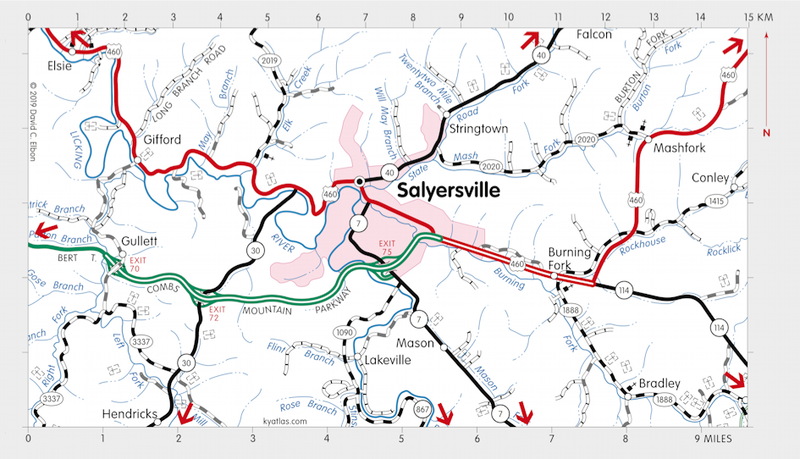 Salyersville was incorporated in 1867. The population of Salyersville in 2010 was 1,883.